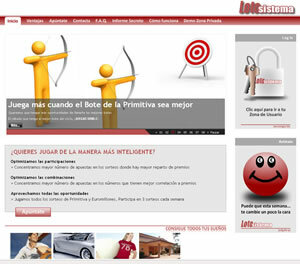 LotoSistema is a website that works as Spanish Primitiva Lottery and EuroMillions syndicate that works exclusively online (with no physical offices). – Playing in the most comfortable way. We generate bets, organize the rocks, send each customer a personalized email with betting playing before each draw, and another email with the achieved prizes after each draw. – Playing in the most profitable way possible. Our system gives more weight to the numbers that have a higher correlation awards and employing a reduction to 5.No touch can make us more times, but we can do that when we touch, we touch more money. All, with an automated system that does it all. – Controls the high new partners, and calculates the fees payable to webmasters who send us new partners. – Generates debits for payment of shares. – Generates bets required for each draw, and sends them to the Lottery Administration validate. – Send emails to customers when the lottery tickets are confirmed in the safe. – Make the distribution of prizes and seats in the account of each customer. – Send emails with the achieved awards. LotoSistema is designed as a high value-added service for customers, but with a very high degree of automation, to reduce structural costs of maintaining the service.